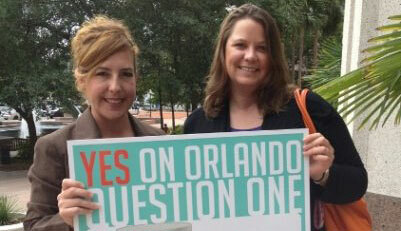 ORLANDO, Fla. – Community activists, labor and other forces kicked off a campaign May 16 for a ballot initiative that would require private employers in Orlando to offer their workers up to seven days of paid sick leave per year. Government workers and employers with less than 15 workers would be exempt. Citizens For a Greater Orlando (CFGO), the group spearheading the campaign, must collect 22,000 voter signatures by the end of July to place the measure on the November ballot. If they’re successful, Orlandoans would have the chance to decide if their city becomes the first in the Sunshine State – and in the South – to mandate paid sick time. Speakers at the City Hall kickoff rally stressed the benefits to people, businesses, public health and the local economy along with the ethical dimensions of making paid sick days available to workers. “Setting a standard is the right thing to do for our businesses and the city,” said Fred Barr, a local business owner and member of the Community Business Association, which advocates for independent businesses in Central Florida. “There’s a strong business case for it,” said Barr, noting that paid sick time will engender employee loyalty, reduce turnover costs and produce savings in health care. Barr predicted that advocates for big business, such as the Chamber of Commerce, would claim that their opposition to the measure was based on concerns about its supposed impact on small businesses. “If that happens, people should ask the lobbyists who’s paying their salaries, and how much of it is coming from big-box stores, chains and other corporate interests that are too big to know their employees by name,” said Barr. Paid sick days would, the speakers stressed, be particularly helpful to working mothers, those with low-wage jobs in general – 80 percent of whom don’t have paid sick time – and those employed in the service and hospitality industries, major components of Florida’s economy. Advocates for the measure emphasize that it would be an earned benefit, since employees would have to work 37 hours for every hour of paid sick time, and they would have to work the equivalent of 52 40-hour weeks to earn the full seven days (56 hours). Certain conditions would apply, including reasonable notice of foreseeable leave, and employers could require documentation if more than three days leave is taken. Discrimination and retaliation for taking up to seven days off would be prohibited and the ordinance would be enforceable in court. Employers who already offer the same amounts of paid time off or paid vacation time with the same conditions of use as the ordinance would not have to change their policies. Nationally, 49 percent of Latinos lack access to paid sick days while 37 percent of working women (more than 13 million) in businesses with more than 15 employees cannot take a paid sick day when they or a family member are ill, according to CFGO. “From the standpoint of my faith, earned sick time comes down to a simple question of fairness,” said Victor Torres, who spoke on behalf of the Hispanic Ministry of St. John’s Episcopal Church. Torres, a member of the Amalgamated Transit Union and a Democratic candidate for the Florida State House, District 48, noted that working women who miss work because of illness or to care for an ill family member often face termination or discipline. “Earned sick time reduces the strain on families living paycheck to paycheck,” he said. An analysis by the Institute for Women’s Policy Research (IWPR), found that 55 percent of employees in Florida (and 58 percent nationally) had some access to paid sick days in 2010. However, “many still face restrictions on the use of sick days and may be unable to use sick days to care for sick family members or seek out preventative care,” said the IWPR. Coming to work sick or when a family member is sick “has serious implications for the spread of contagious diseases in workplaces generally, including those where public health is of particular concern such as restaurants, hotels, retail stores, schools, nursing homes, and child care facilities. This inability causes the needless spread of disease, leads to productivity losses at work, and risks the health of those who cannot afford to stay at home without losing pay and, potentially, their jobs,” according to the IWPR analysis. A 2011 IWPR report found that providing paid sick days to workers who lack access could prevent 1.3 million hospital emergency room visits each year in the U.S., reducing medical costs by more than $1 billion annually, with over $500 million in savings for public health insurance programs. Since 2006, voters or elected officials in San Francisco, Washington, D.C., Milwaukee, Seattle and Connecticut have passed measures mandating paid sick leave. A 2011 IWPR analysis found that the San Francisco ordinance (in effect since 2007) had no negative affect on employment, which grew faster in San Francisco County between 2007-2008 than in surrounding counties. Even during the Great Recession unemployment increased less in San Francisco than in surrounding areas. Photo via Yes on Question 1 Facebook page. Ben Markeson covers events in Florida for People's World. A native of Florida, Ben is an activist and a member of the Communist Party. 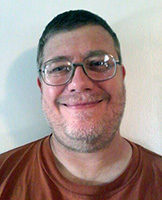 Ben enjoys film, classical music and jazz, history, politics, comics and cats.